MicaNews is reporting PrivateMI Helps More Families Achieve Homeownership in January. What the headline should read is "The bottom falls out of PMI applications". Mortgage Insurance Companies of America (MICA) reports that 90,330 borrowers used private mortgage insurance (PrivateMI) to buy or refinance a home in January. The number of borrowers using PrivateMI in January was 43.9% lower than the December total of 161,172. The number of PrivateMI applications received in January by MICA members was 95,131 or 40.5% less than the 160,038 received in December. The dollar volume of primary insurance written on newly originated 1-to-4 family conventional mortgage loans totaled $13,633.4 million in January, a 48.8% decrease from the previous month’s $26,666.8 million. Traditional primary insurance totaled $10,038.3 million and bulk primary insurance totaled $3,595.1 million in January. In that same month, primary insurance in-force totaled $616,139.6 million. 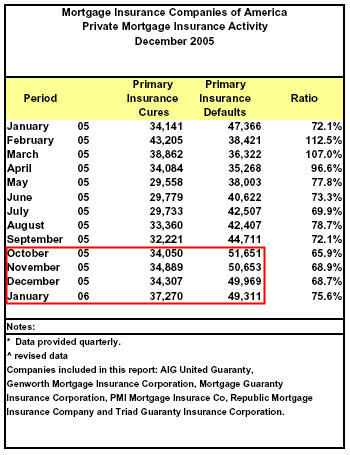 MICA members reported 37,270 cures and 49,311 defaults during January. The statistics in this report include data from the following member companies: AIG United Guaranty, Genworth Mortgage Insurance Corporation, Mortgage Guaranty Insurance Corporation, PMI Mortgage Insurance Co., Republic Mortgage Insurance Company and Triad Guaranty Insurance Corporation. MICA is the trade association representing the private mortgage insurance industry. Its members help loan originators and investors make funds available to home buyers for low down payment mortgages by protecting these institutions from a major portion of the financial risk of default. Housing starts jumped 14.5 percent to an annual rate of 2.28 million last month, the highest since March 1973, the Census Bureau reported. Economists surveyed by Briefing.com forecast that housing starts would come in at an annual rate of 2.02 million in the month. 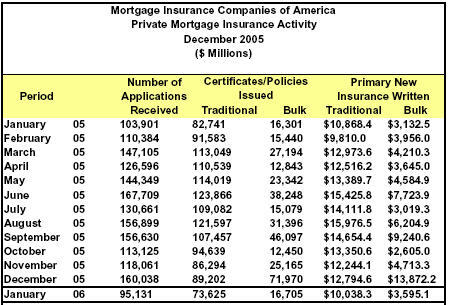 The bottom is falling out of Private Mortgage Insurance. What are these numbers telling us? The January seasonal adjustments to housing starts are bogus? Builders are scrambling to build everything they can before the bottom falls out? The January PMI is an outlier? People are putting more money down therefore need PMI? Fewer people are buying houses? Some combination of 1, 2, 5? No doubt the bureaucrats overdid their January seasonal adjustments. January is expected to be cold so they add starts to smooth seasonality. Figure in a bunch of panicked builders on top of it, all scrambling to get rid of their land inventory while the getting is good, and voila you have the makings of a blow off top in housing starts. Obviously #4 is laughable and does not fly in the face of recent home buying trends. Defaults picked up in October (the Katrina effect?) but have been steady since then. What is interesting is that cures went up as well. I do not think that flies in the face of the increasing numbers of bankruptcies we have seen, but it is what it is. Expect this conundrum to resolve itself via increasing numbers of defaults. Both sets of numbers will be interesting to watch going forward.